StarkLight Press made 2016 the Year of the Collaborative Novel with not one, not two, but three collaborative novels with some of the brightest lights in the world of new authors. 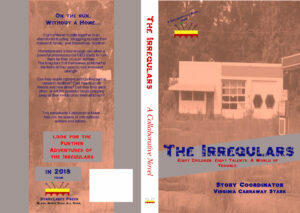 We would like to introduce you to the first collaborative, The Irregulars. This story centers around the lives of eight homeless children, all with a different disability… and each with a special psychic gift. These runaways have banded together, scrimping and scavenging on the edges of cities in the Pacific Northwest. Until one fateful day, an ominous car finds the Irregulars. The car is from Protean Pharmaceuticals, and the driver is a woman who is known to at least two of the children. The hunt is on for The Irregulars, and the kids are forced to flee from the Machiavellian plans of Protean’s CEO, and from the secret psychic program the company uses to bend gifted children to their will. Who can the Irregulars trust? Where can they go? And will they survive? Meet Cadence and Jeremy Colton, brother and sister who survived a murder and can move invisibly, and stop time; Milton Cole, who ran from an abusive family and is highly conductive; Bruce Eastern, a young Native runaway whose fiery temper matches his power; Kevin Parker, a boy who lost his voice for good and can move like the wind; Jenna Busche, an addict who needs her fix to offset the pain of her transmogrifications; Maddy Hearing, a blind girl with the voice of an angel; Thia George, a girl in a wheelchair who can speak with her mind. Can these amazing misfits control their powers, their passions, their pain, long enough to escape from Protean Pharmaceuticals? Long enough to become the family they so desperately need? Look for The Irregulars, coming from StarkLight Press this October! Tune in here throughout October for video and print interviews from our eight authors!